KidStart Magazine > Family Life > Parenting > Have you succumbed to the slanket? Have you succumbed to the slanket? 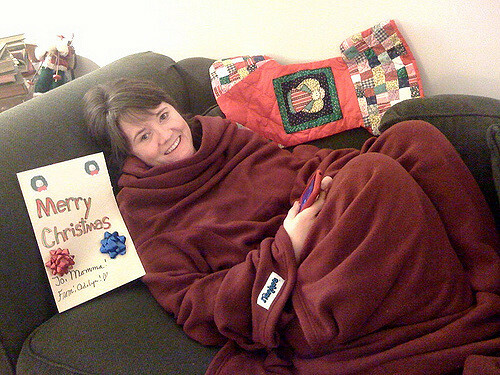 Slanket is one of the biggest-selling gifts this Christmas. Apparently, a sort of snuggly blanket that envelops your entire body. The effect of the slanket is slightly caterpillar/Jabba the Hut, depending on your body shape. Although I can see the appeal in the current cold snap. I would imagine wearing one encourages you never to leave the sofa. However, if you are planning to buy one, either as a gift or for yourself, they sell them at Lakeland and Firebox. The product have become very popular in the US, where chat show hosts Jay Leon and Oprah Winfrey have featured the product. As many as five million Snuggies have already sold there. The actor from the Die Hard movie, Bruce Willis, wore his slanket on the David Letterman show. Numerous viral websites have been created because of it, where owners can share pictures wearing their very own slanky.